Misty® AltraSan® Air Sanitizer & Deodorizer TRF -6 oz. Misty® AltraSan™ Air Sanitizer & Deodorizer HSS -10 oz. Misty® Multipurpose Disinfectant Cleaner - 20 oz. Net Wt. Misty® Dual Action Disinfectant - 12 oz. Net Wt. 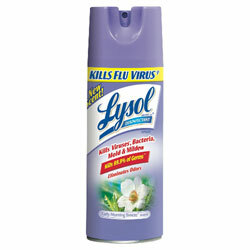 Lysol® Disinfectant Spray To Go - 1 oz. Lysol® Brand III I.C.™ Disinfectant Spray - 19 oz. ITW Dymon® Medaphene® Plus Disinfectant Spray - 20 oz. PRO-LINK® Disinfectant Spray - 15.5 oz. Net Wt. Misty® Surface Disinfectant - 16 oz. Net Wt. Champion Sprayon® Phenol Disinfectant - 15.5 oz. Net Wt.